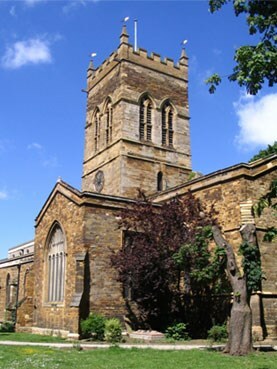 St Giles is a large cruciform church with an imposing central tower. The tower dates from the 17th century but has Norman foundations. Most of the chancel is 700 years old and the transepts and chapels 600. The church was substantially enlarged in the 1850's. Prior to 1783 the tower contained six bells. Edward Arnold of St Neots cast eight bells for the church in 1783 and these comprised the original bells recast to form the back six together with two new treble bells. There is a record of an early peal of Plain Bob Major being rung but the date of the peal isn't known. It is known however that a peal of Grandsire Triples was rung on 8th April 1783 and this is probably the first peal rung on the Arnold bells. Three peals are known to have been rung on these bells before the ring was augmented to ten in 1895, to become the first peal of ten bells in Northamptonshire. The two new bells were the gift of the Holding family. At the same time the bells were rehung on plain bearings in a new metal "H" frame, the work being carried out by John Taylor & Co of Loughborough. The first peal on the ten bells was Grandsire Caters rung on 17th December 1898. The back two bells were put on ball bearings in the 1920's, and the whole peal were fitted with new bearings and tuned in 2004 by John Taylor Bellfounders Ltd. Up until the end of 2011, 193 peals had been rung in the tower. "April 1783. On Monday last the new peal of eight bells cast by Mr Edw. Arnold of St Neots in Huntingdonshire for the Parish Church of St Giles in the town (the tenor whereof is in D sharp weighing 25 Hundred) was opened by the Society of Change Ringers from Leicester; when a variety of peals were rung in the hearing of a great number of Persons assembled on this occasion, who expressed the greatest satisfaction at the pleasing and harmonious Tone of them. After which a respectable meeting of the Inhabitants of the Town, with the Society, dined at the Saracen Head Inn, where the day was spent in the greatest Harmony and good Humour. And on Tuesday Morning the above mentioned Society went through Mr Holt's Complete peal of 5040 Grandsire Triples in 3 Hours and 22 minutes, which was allowed by the best judges to be a most excellent Performance, at the conclusion whereof the society walked in Procession from the Church (preceded by a Band of Music) to the above Inn, amidst the plaudits of a great number of spectators - well pleased with such a melodious entertainment"
The ringers were: John Martin, Treble; William Thacker, 2; Thomas Armstrong, 3; Thomas Scott, 4; Mark Graham, 5; Daniel Loyley, 6; Joseph Smith (Conductor), 7; Richard Wright and Thomas Dudley, Tenor. In the second reference Morris is discussing Samuel Lawrence, a celebrated eighteenth century ringer. Lawrence who came from Shifnal in Shropshire, was supposed at the time to be the second heaviest man in England, weighing upward of 32 stone. He rang in seventy two peals, and number 15, dated June 4th 1787 is recorded as being 6000 Bob Major rung at St Giles Northampton, which Lawrence called. Fvgr ers bar frira guerr (ybj qbja).